Plucky Marilla Cuthbert is 13 years old when her mother dies in childbirth. Marilla suddenly bears the responsibilities of a farm wife: cooking, sewing, and keeping house for her brother and father. Avonlea holds few options for farm girls. Her one connection to the wider world is Aunt Izzy, an opinionated spinster whose talent as a seamstress has led to a thriving business. Emboldened by her aunt, Marilla discovers new friends and opportunities beyond Green Gables. She raises funds for a Nova Scotia orphanage that is a way station for runaway slaves from America. The dangerous work of politics and abolition jeopardizes all she cherishes, including her romance with John Blythe. 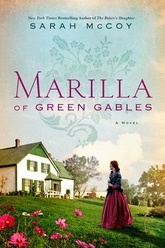 Will she choose her dreams or the reality of Green Gables?